I love pairing wine with food. When Janie from House of Jerky asked if I would like to sample their jerky products to pair with wine, I jumped at the chance. Thirteen different types of jerky arrived! A variety of meats- boar, buffalo, venison, turkey, beef, as well as seasonings from black pepper to sweet & spicy to HOT. There is so much to cover, I’ll talk about the specific jerky and wine pairings in a separate post. 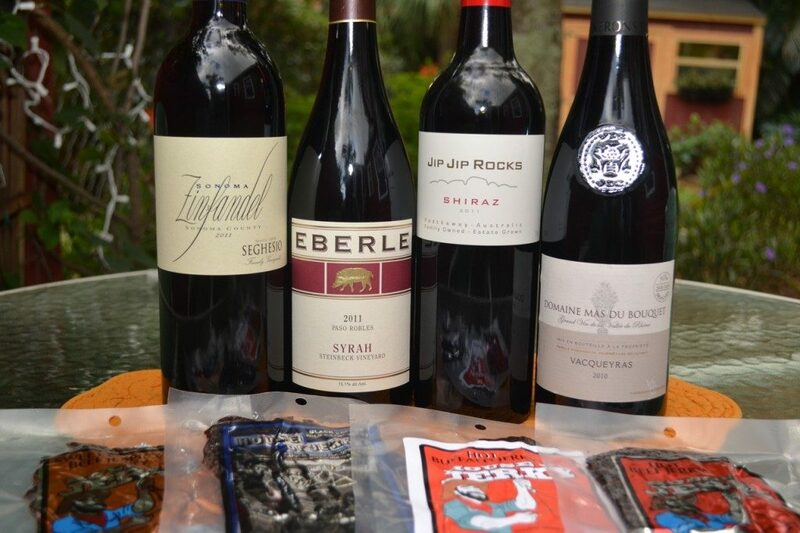 Here, we will take a look at the seven wines I selected to sip while enjoying jerky. 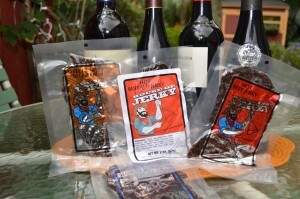 WHAT RED WINE DID WE PAIR WITH THE JERKY? I was drinking the heck out of the 2005 vintage of this wine back in 2008. Dark garnet in the glass, the bouquet of the Jip Jip Rocks Shiraz 2011 is mixed black and red berries, with some spice scents. A jammy palate up front, with bold fruit flavors of blackberry and raspberry. The mid-palate turns to cooking spice and pepper, but they disappear on the finish rather quickly. 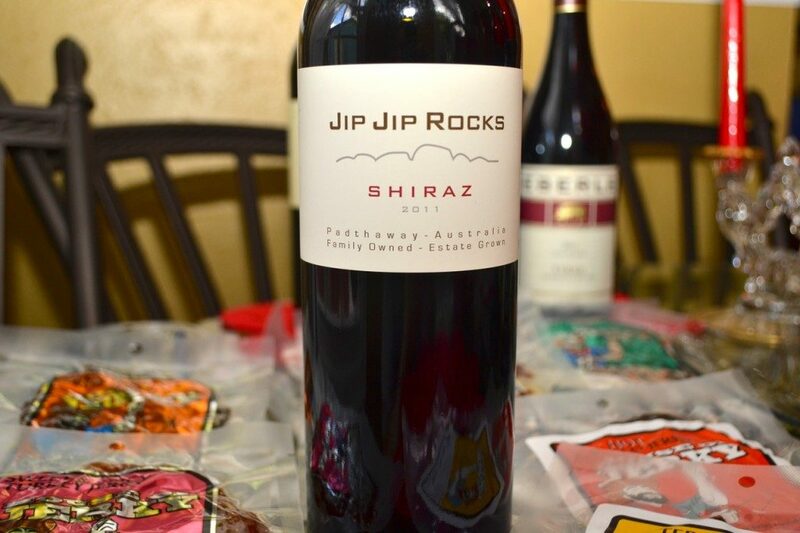 Jip Jip Rocks Shiraz 2011 is big jammy fruit, though there is good spice to balance, followed by a little menthol on the finish. For $16.99, it was a decent wine. Zinfandel works nicely with smoked meats and Bar-b-Que. 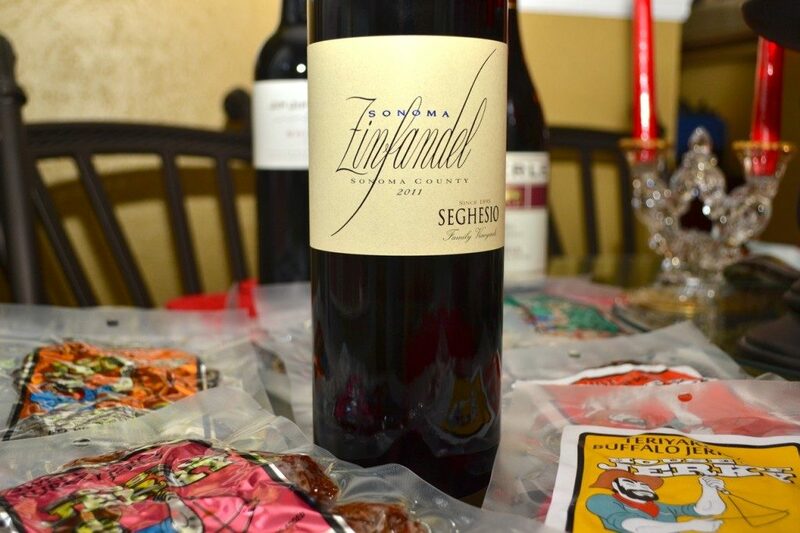 The Seghesio Sonoma Zinfandel 2011 has a dark garnet to purple color, and a bouquet of blackberry and licorice with subdued vanilla, raspberry, and strawberry scents. The palate is full, with the spices and red fruit come on fairly powerfully at the approach. There is a great spice and pepper on the mid palate to the finish, with a very long lasting christmas spice/baking spice component. There are great notes of vanilla from the oak aging, as well as cola flavors throughout the palate. For $20, a very nice wine. 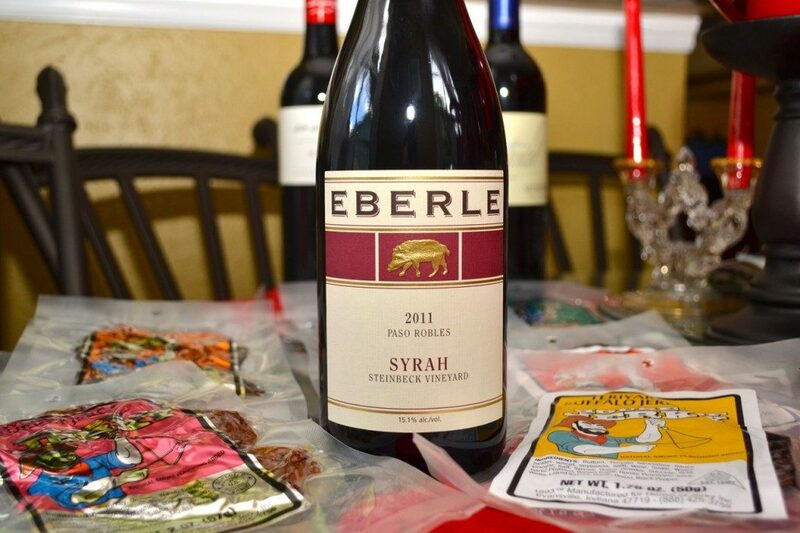 Hailing from Paso Robles, California, but very French in style, the Eberle Syrah 2011 has a dark garnet color, with a very subdued nose; spice and tobacco along with raspberry blueberry on the bouquet. The palate has great depth, earthy tobacco and leather wrapped around dried spiced berries. There is a beautiful warming spice on the palate that offers a very lengthy finish. Another very nice wine at $20. 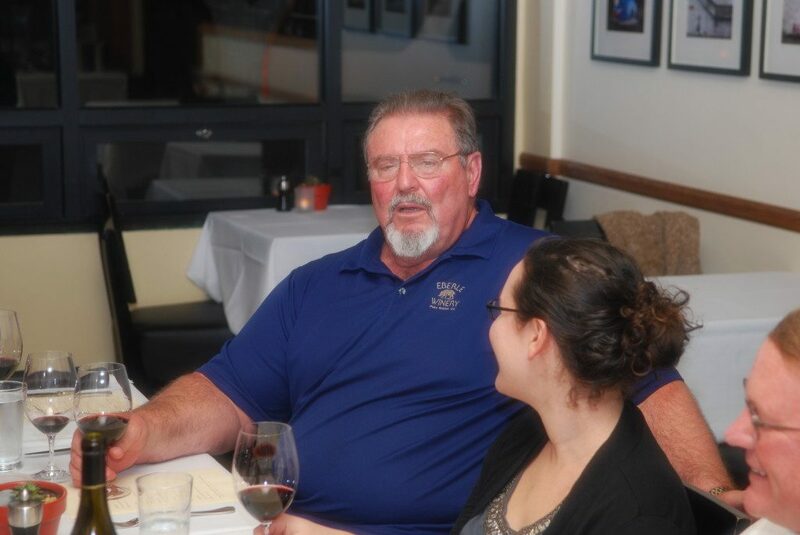 I was fortunate to meet Gary Eberle when I visited Paso Robles in 2011. He is a bear of a man, in size and in presence. His stories captivated the group, from bringing French vines to California in the 1970s to flying his own plane. It was an honor to meet him, as well as Steve Lohr of J Lohr, Ken Volk of Kenneth Volk Vineyards, and Stephan Asseo of L’Aventure. The fourth red is from Vacqueyras, an appellation in the southern Rhone Valley of France. 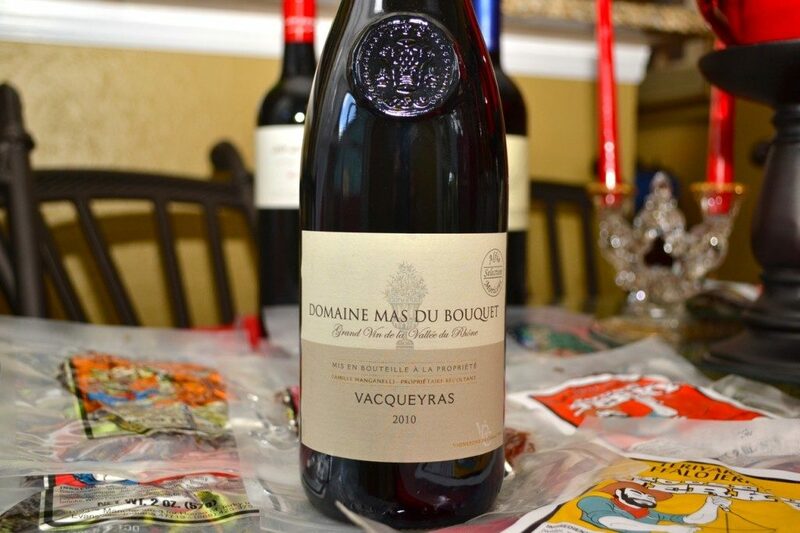 Domaine Mas du Bouquet 2010 Vacqueyras is a blend of Grenache, Syrah and Mouvedre, or GSM. A soft bouquet of dried red and black berries, the palate is very soft, dried blueberries, and violets. This $19 wine was given a 90 point rating by Wine Spectator, though I don’t find it as intense and racy as their notes suggest. I find it a bit more floral and feminine, and perhaps there is a bit of bottle variation to consider. After trying some of the spicier jerky from House of Jerky with the red wines, I decided we needed a bit of white wine in the mix. The red wines would often keep the heat going, which is great if you LIKE heat. I, however, like to balance the heat with the fresh fruit and florals of the white wines I selected. The white wines in this article were provided as samples. As always, my reviews of wines are not influenced by the fact they were provided to me. WHAT WHITE WINE DID WE PAIR WITH THE JERKY? I’ve paired Riesling with spicy foods in the past, it works nicely. There is a host of delicious riesling available, from all over the world. 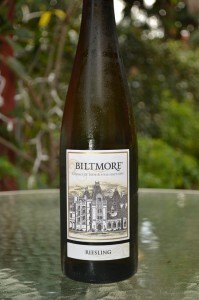 For the HOT and Sweet & Spicy Jerky pairings I went with The Biltmore Riesling. This wine had a nose of peaches, with slight citrus aromas. The palate was thick, honeyed with gentle peach and nectarine flavors. There was a little acidity on the finish, but not sharp by any means. For $10 at Total wine, it was a pleasant wine. The semi-sweet palate would appeal to those who are not fans of dry white wines. While there was no vintage on this wine, it was harvest in 2010. Wines labels with an American appellation are not permitted by law to carry a vintage date on the label. 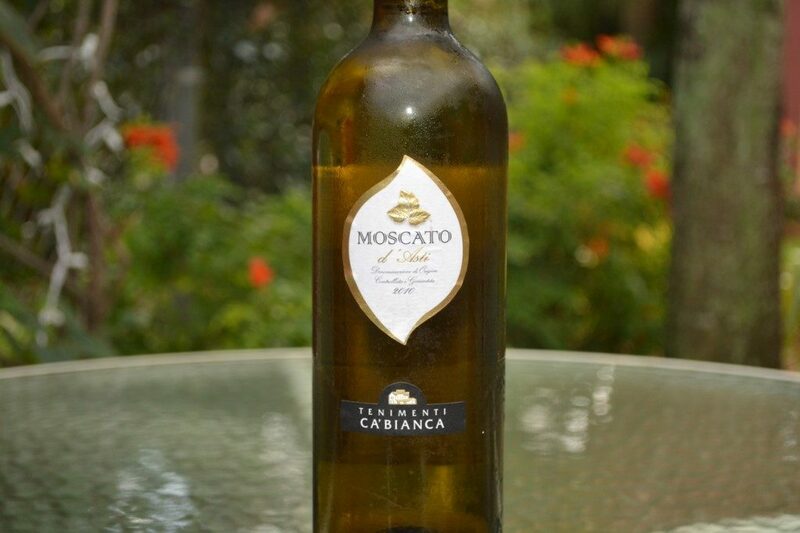 I was absolutely enthralled by this $16 bottle of Ca’Bianca 2010 Moscato. I was at first dismayed that the nose was rather non-expressive. However, this slightly frizzante wine has a crushing palate! Cascading flavors of white peach, white flowers, and sweet honey dance all over the tongue. There’s no noticeable acidity, and the frizz is fun. This light and crisp wine is perfect for those who like fresh fruit, or prefer sweet wines. The Ca’Bianca 2010 Moscato was perfect with the spicier jerkys. The last wine of the wine and jerky pairing is another Riesling, this one from Germany. 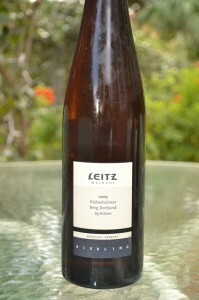 The Leitz Weingut 2009 Rüdesheimer Berg Rottland Spätlese is a brilliant hay yellow in the glass. A zippy nose of petrol and peach/stone fruit. The palate is medium bodied, with ripe peach and apricot, and a hint of acid that’s playing hide and seek with the super fresh fruits in the glass. 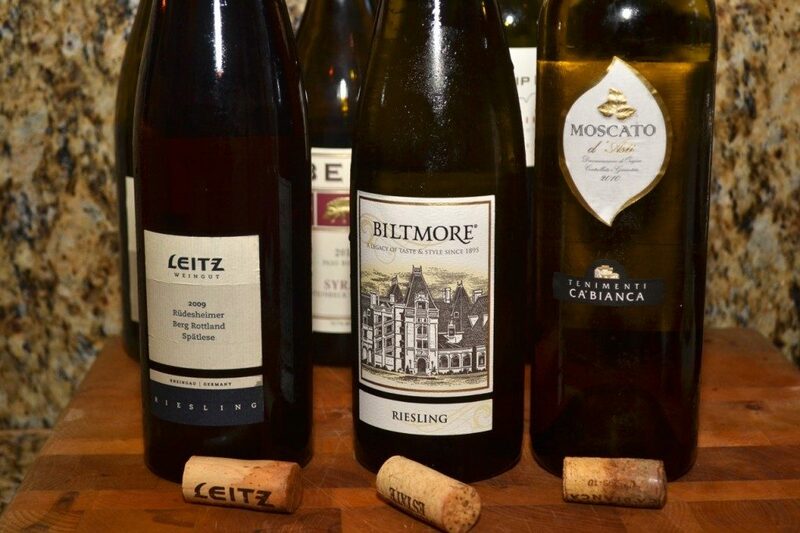 The Leitz 2009 Riesling is heavier than the other whites, though less sweet, even though it’s a late harvest wine. This $33 wine was cellared for two years, and that likely toned down some of the acidity and freshness. These wines all work well with a variety of foods, or on their own. Coming up, you’ll see which of the House of Jerky products the wines compliment best.